Every now and then a long term and frequent visitor of Whistler will grace us with their stories of this valley’s past. Gordon Cameron is one such character. 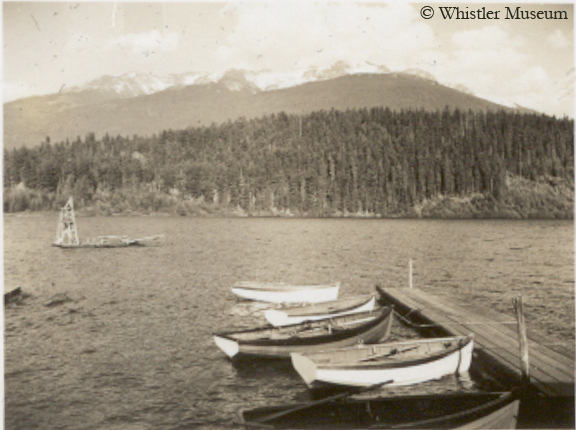 As a young man, Gordon (also known as G.D.) would spend summers at Alta Lake with his family. A few years ago, Gordon wrote two letters to the museum outlining some fascinating stories from his childhood here in Whistler. 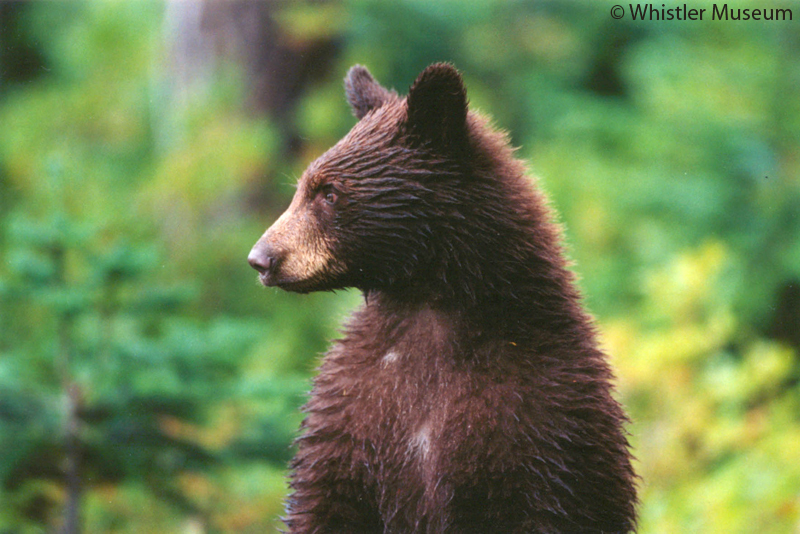 One story he recalls involves a cougar, a bear, and a boisterous Myrtle Philip. Alta Lake from Rainbow Lodge, 1944. Photograph by G.D. Cameron. Philip Collection. Firstly, to paint a better picture of Gordon and Myrtle’s relationship, Gordon explains Myrtle’s unorthodox method of teaching a young G.D. how to ride a horse. Basically, Myrtle tied Gordon’s feet together underneath the horse’s belly and let boy and animal be! The horse reluctantly traipsed around Alta Lake with the boy strapped firmly astride for most of the day, until it finally managed to shake loose the ties and buck the young Gordon into the River of Golden Dreams. 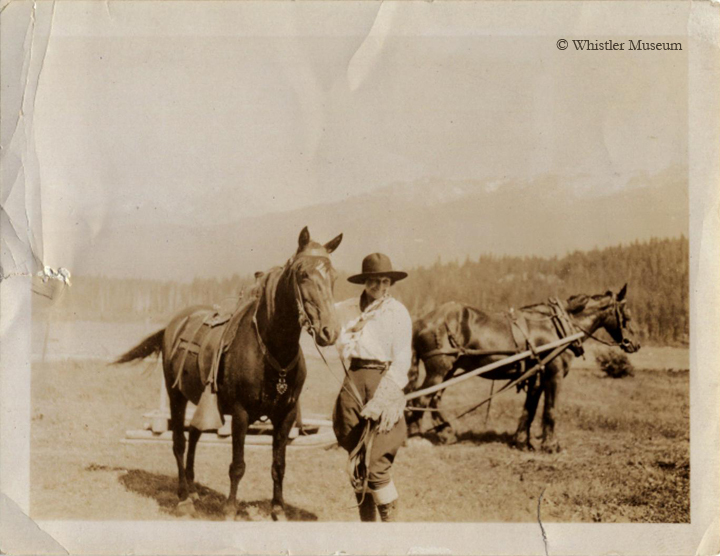 Myrtle with saddle horse and workhorse, ca. 1915. Philip Collection. 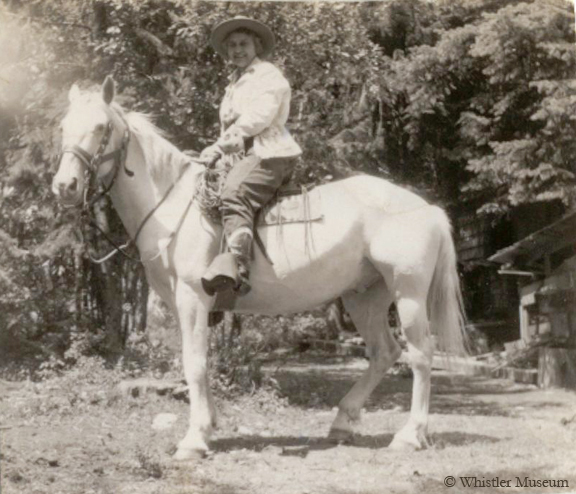 Myrtle on a white horse, ca. 1940. Philip Collection. As if we didn’t have reason enough to adore Myrtle and her courageous ways! Have you ever found yourself in an unlikely relationship? Perhaps a friendship with someone you thought you’d despise, a romance working against all odds or an interspecies partnership with your pet that you never expected to grow so strong. Most of us at some point in our lives have been pleasantly surprised by an unexpected yet beautiful relationship. 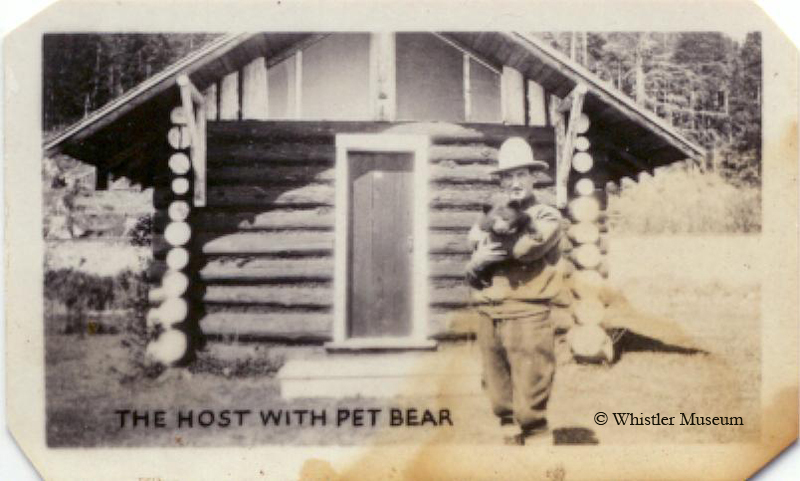 Conceivably, the most unlikely duo in Whistler’s history is Molly the bear and McGee the pig. 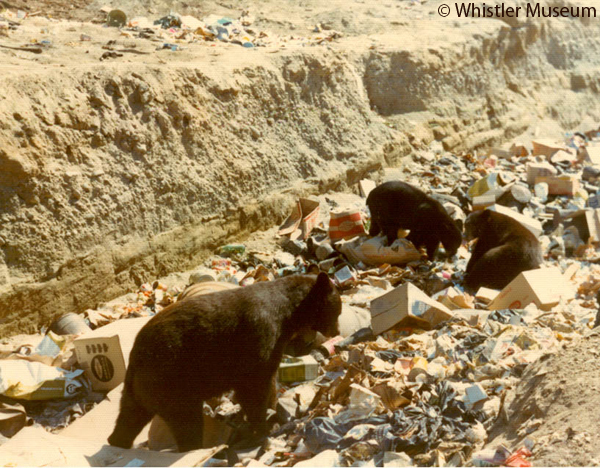 So how did a pig and a bear come to be such great friends? Well, McGee the piglet was bought by a young girl named Betsy (DeBeck) Henderson at a farmer’s market in New Westminster, while Molly the bear cub was adopted by Betsy’s father. 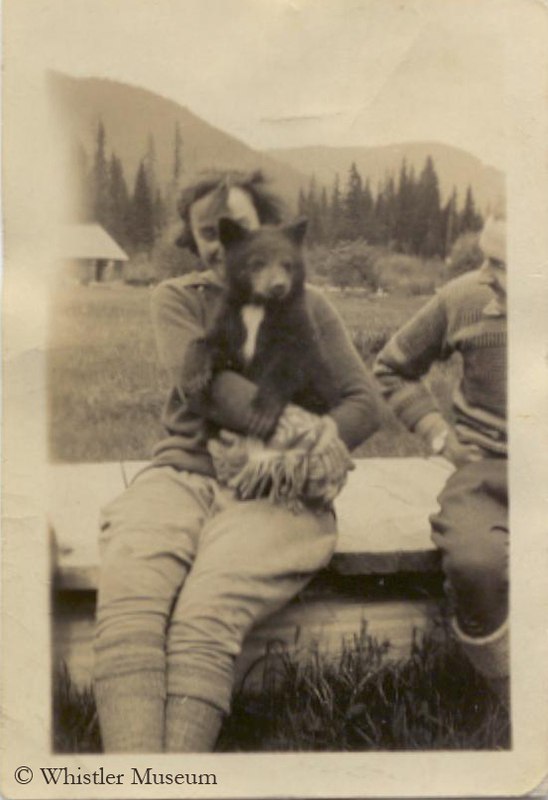 Molly was originally from Bella Coola – where Mr. Henderson worked – and went by the name, Crisco (because she loved to break into cookhouses and eat shortening). Betsy spent two summers at Green Lake in 1936 and 1937. During this time, Betsy’s brothers worked in the logging industry, also at Green Lake. Determined to keep the family close, Betsy’s mother insisted the family rent a cabin on Green Lake. They did just that, and with them came the whole family – including a cow, McGee the pig, Molly the bear and a Springer Spaniel named Freckles. So began the unwavering bond between pig and bear. Neither of them took to the other animals the same way they did to each other. The two would play, eat and nap together. It’s safe to say that they rarely left each other’s sites. Even when the family would play a game of baseball, McGee would watch Molly as she’d try to grab the players and stop them from running from base to base. After spending two summers at Green Lake, the DeBeck family continued their journey and moved to Victoria. What we know of Molly and McGee ends here. However, in the spirit of Valentine’s Day, perhaps this strange and dynamic duo will inspire all of us to be especially appreciative of those unexplainable relationships in our lives, approaching them with nothing but warmth and love.